This item is selling for $9.72 on eBay. 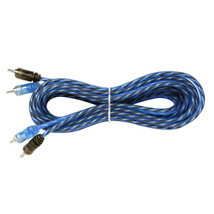 Universal 17' Core Series Twisted RCA Cable (EFXRCT17) by Scosche®. Split-Tip, Micro Barrel. Single Blister Retail. The Scosche mission is to produce edge, innovative accessories with competitive pricing. To understand the consumer and create Scosche products they will enjoy manufactured with the American ingenuity and quality they expect. Twisted Pair Construction: For increased noise rejection and enhanced sound quality. Flux-tinned OFC Strands: For optimal signal transfer and corrosion resistance. Split-Tip Center Pin and Segmented Shield: For maximum contact and connection reliability.